I think this thing may work in a similar way to a hurdy-gurdy, which, though obscure, isn't quite that obscure. You might like to look into contemporary hurdy-gurdy performers, if there are any. Though most of them will probably turn out to be too conventionally folksy for your tastes. Incidentally, talking of strange, obsolete instruments, has anybody except Ivor Cutler ever dared to play the harmonium on what they hoped would be a famous cult LP and actually gotten away with it? Go on, let's have a bit of Ivor Cutler! The more obscure the better! Anyone whose fans included John Lennon, John Peel, Bertrand Russell, and me is a force to be reckoned with! 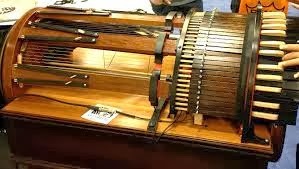 There's a vid online of one of the instruments' inventors comparing it to a hurdy-gurdy, tho this is of course goes far beyond - the most deluxe model has a 66-key keyboard. Oh I loves me some Ivor Cutler, but I'd wager that Nico had the most success with the harmonium. 'twas a perfect match for her goth-y droney voice. I'd completely forgotten about Nico, probably because it's almost impossible to think about her and Ivor Cutler at the same time. Though I must admit that "Andy Warhol presents Ivor Cutler's Life in a Scotch Sitting Room With Nico" might have been interesting. Some buyers would probably have been baffled when they peeled the herring off the cover to reveal a vaguely herring-shaped whimsical doodle that looked nothing like a stiffy, and disappointed by the complete lack of fashionably edgy heroin references - "I'm waiting for my man, 26-gallon porridge bucket in my hand..." but it would have been different! Bearing in mind that Ivor worked with George Martin, was the tour guide of the Beatles' Magical Mystery Tour, Buster Bloodvessel (not be confused with the other one! ), and appeared on a Neil Innes TV show (very briefly) as the Incredible Hulk, he might have been up for it! I met him several times. What a lovely man! I loved the sound of this new instrument. It is incredibly that a solitary musician can play a repertoire usually intended for more musicians. Defy what many would think, I believe this is an incredible oportunity for creating new music. It produces a soothing sound, I don't know why this new instrument has been unassuming. Felipe, the price is an obstacle for now. Perhaps if it's more widely manufactured and the price comes down, we'll hear more of it. Why am I not surprised that you met Ivor Cutler, Count? The only more absurd image conjured up than Cutler and Nico playing "Duling Banjos" on their harmoniums is Cutler jumping about in a kooky ska band with the other Buster Bloodvessel. What an interesting party THAT would have been. I invented this in my mind back in the 70s — trying to think of how a keyboard could do continuous sounds, and coming up with a rosin-coated drum that would rotate and contact the strings. Little did I know that DaVinci had already been there, and that the same principle was used for the Violinola and other player violins. Still, I did it without help. That counts for something. With me, anyway. I was under the impression that, although the idea of rotating disks coming into contact with strings and thus creating a bowless violin has been around for a very long time, the difficulty of getting a pure note has always stopped them from becoming popular, except as fairground or novelty instruments. Maybe this device has to be that expensive because you really need a superbly-crafted instrument if it isn't going to sound awful? The most ambitious application of this idea ever was undoubtedly the Panharmonicon, which had nothing to do with H. P. Lovecraft, but it probably should have, seeing as it was a life-sized orchestra of clockwork angels! Sadly it does not survive, but back in the day it was sufficiently celebrated that no less a fellow than Beethoven wrote a piece of music for it! The "Battle Symphony" is almost never performed because it's terrible, but you can't blame Ludwig, seeing as he had to work within the capabilities of this weird gadget. Listening to what he wrote, it's apparent that percussion was its strong suit, but strings, not so much.